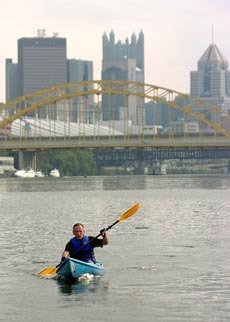 A good way to see Pittsburgh from another vantage point, and to get some exercise doing it, is to take a kayak tour of Pittsburgh. The Three Rivers Rowing Association is offering them on Thursday nights and Sunday mornings through Aug. 31. The tours, which launch from the TRRA boathouse in Millvale, are free for members, $25 each for nonmembers. Reservations must be made in advance. « Kayaking can be fun.. but difficult.